A single IR Lightbar is extremely powerful. For most people this is enough to control almost anything in a living room. However, if 1 is good, then 2 must be even better, right? The iWavit USB dongle can support 2 simultaneous Lightbars and double your range (Connector splitters and extra Lightbars are sold separately). 2X the Power. 2X the flexibility. In some cases it may be necessary to use an extra Lightbar. For example, if you have a very large living room and want to control devices in opposite corners of the room, or if you want to place one IR Lightbar inside a cabinet while you leave the other outside in the living room. You can actually connect up to 6 IR Lightbars to a single iWavit USB dongle - That is a total of 36 IR LEDs for ungodly IR blasting! Inside most iWavit apps, there is an option to emit IR light out the front of the iWavit Attachment like a normal remote control, or to blast the IR light from the IR Lightbar instead. (See illustration to the right). 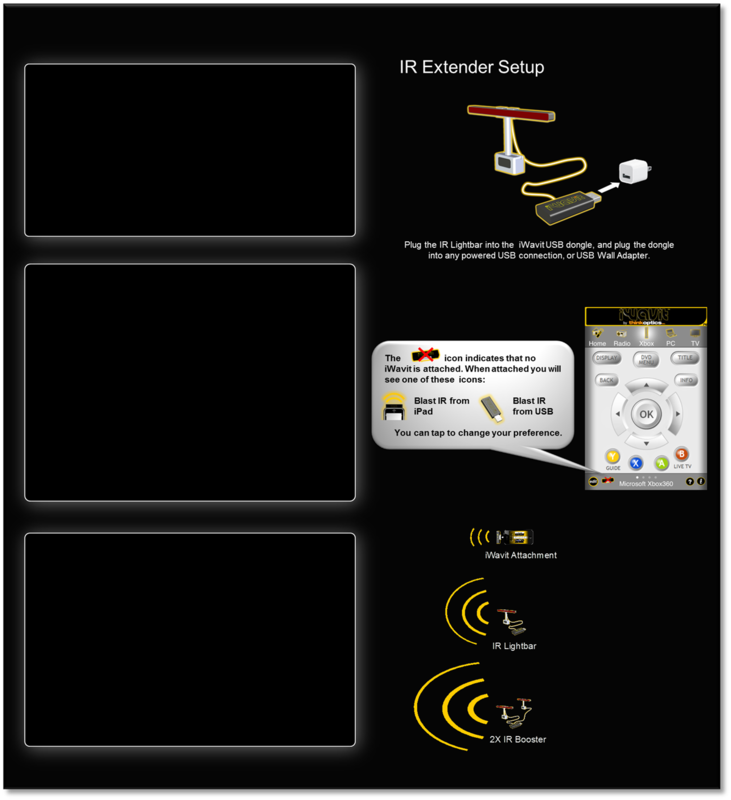 If you select the �Blast From USB� then all IR light will be blasted out of the extremely powerful IR Lightbar which will be able to control almost any IR device in the same living room. (The IR light will bounce off walls so you do not need line-of-sight). Why is the IR extender good? 1. Action at a distance: You can now be 300 feet away and still control all your IR devices in the living room, or where the IR Lightbar has been set up. 2. No need to point: You don�t have to point your remote at the device to be controlled anymore. 3. Enabling IR Activities: In the Tabula Rasa app you can now reliably create �Macros� (Activities) for a single button to control many devices at once, even if they are not right next to each other. The USB dongle and IR Lightbar can also act like a Wireless IR Extender. Just plug it into ANY powered USB port (for example, the back of your TV, your wall plug adaptor, a PC) and it will automatically configure itself as an IR Extender. When you plug in the USB dongle, it will park itself on an un-used RF channel. Now, plug in the iWavit Attachment into your iPhone, and it will in turn look for any and all iWavit USB dongles within range, and will automatically associate with the nearest one.